The book is neither a memoir nor an insider’s account of the organisation. It’s more of a primer, written by that rare intellectual among spies. India is a country where everyone has an opinion about intelligence but few have any idea about how to go about it. Journalists hold forth at length about ‘what is wrong with R&AW and… how to fix it’ but have little clue as to how it functions. Politicians regard it as ‘something that needs to be done but is almost certainly doomed to fail’ and not an ‘essential part of statecraft’ as it is in rest of the world. 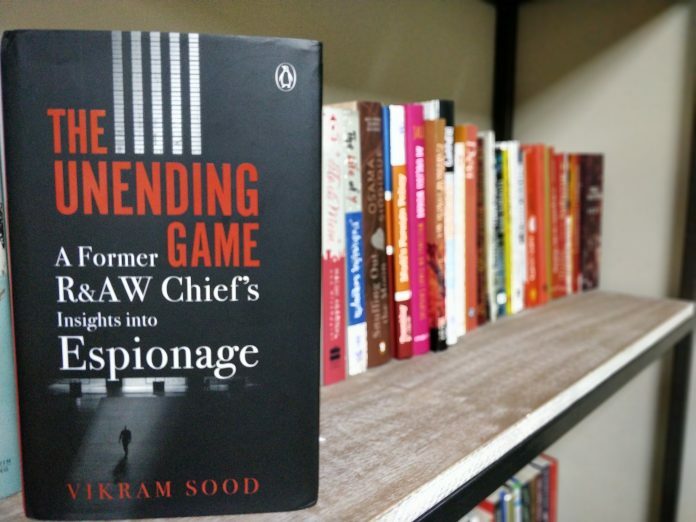 Vikram Sood’s The Unending Game is not another fireside chat of a superannuated sleuth in between Track 2 junkets. He comes across as more of a George Smiley by disposition with the intellect of John Le Carre. But it is not a thriller that he has written. Sood is no ordinary spy who came in from Punjab. Intelligence has been defined as ‘a dirty game played by honourable men’. The title of ‘former R&AW Chief’ on the jacket is marketing bait. But as Sood clarifies in the preface, it is also not a memoir or insider’s account of the organisation he worked for 31 years. Written more like a primer than a manual for intelligence practitioners or reference for experts, it is a fascinating read for anyone who is even remotely interested in the enthralling world of espionage. Lay readers will, at once, be drawn to the section on ‘Tradecraft’ that gives a peek into ‘How Spies Work’ with some wonderful historical anecdotes. Taking them on a riveting journey through the two World Wars and the Cold War, that were undoubtedly the golden eras of classical espionage, it comes closer home to the playing fields of Asia including our very own Raisina Hill. Stories of how the Indian establishment was compromised both by the CIA and KGB are now out in the open thanks to declassified documents of foreign governments, Julian Assange and Edward Snowden. It is common knowledge that a large number of politicians, bureaucrats, diplomats, police and intelligence officers were on the take from foreign Intel agencies. The fact that political parties received funding for elections from the US and the USSR is also not a secret anymore. However, what may surprise the uninitiated is the scale of psychological warfare that played out in India during the 70s and 80s. The KGB once claimed they had “Ten Indian newspapers and one News Agency on their payroll and thousands of articles were planted in these outlets.” Moscow is said to have planted over 160,000 items in Third World Press in its heydays. In India, during 1972-75 alone, KGB pushed 17.000 stories in Indian media. If that was KGB, then the CIA — which always matched its Soviet counterpart measure for measure — would certainly have not lagged behind, Sood deduces. What may be of particular interest in the current situation of political flux across the globe is how foreign powers have often tried to control the narrative — “winning over large sections of the country’s educated ‘liberal’ middle and upper classes.” This is done not just through the media but also funding and promoting “think tanks” and NGOs supplemented by patronage to influencers and opinion leaders. No book on intelligence concerning India can be complete without lengthy discussion of cross border terrorism and Pakistan’s Inter-Services Intelligence (ISI). Explaining the essential difference in the mandate, structure and reporting line of ISI, which is the deep state within Pakistan, Sood debunks the idea of CBMs (Confidence Building Measures) as Utopian and waste of time. We have now entered into the second Cold War or “Colder War” as it is sometimes called. There is the new dimension of Islamic Terror and the youngest cold warrior China, which with its ambitions and increase in control over resources is all set to change the rules of engagement with the world. Russia under Putin is also unwilling to take a backseat in the resource-rich West and Central Asia with even the Arctic becoming more navigable due to global warming. Add to that the new age complexities of cyber warfare, Artificial Intelligence and Data Analytics and it calls for an urgent rethink of our intelligence strategy and overhaul of the Intel Organisation backed by a clear charter and legal cover. Vikram Sood will be remembered as a gentleman and a rare intellectual among spies. Sandip Ghose is a marketing executive and blogger on current affairs. He tweets @SandipGhose.